TSHolden.com : East, with a gun. Artwork » Sketch » East, with a gun. Posted on: December 14, 2006	 East, with a gun. 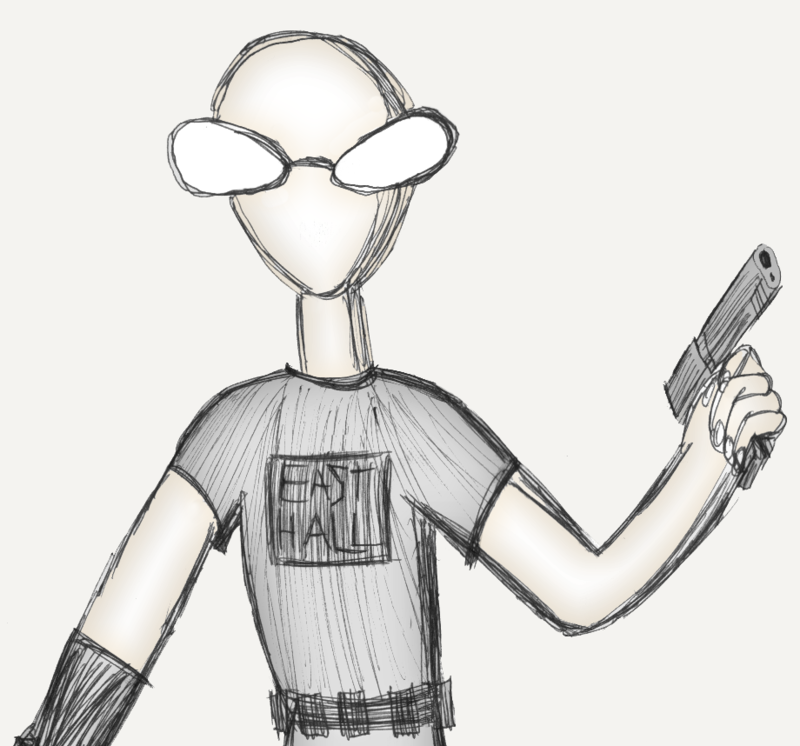 East is an unfinished character who seems to be a blend between Sketch (a stick figure character) and the general feel of my old dorm. (I lived in East dorm my freshman year of college). He's spontaneous, violent, and lives strange hours, and likes his alcohol. This doesn't mean he isn't smart though- East is actually a very clever man, but he has better things to do than think. As to why he has a gun and a gauntlet, the imagination is best let wander elsewhere. This image was sketched with pen and paper and properly photoshopped long afterwards. 6 months after I first posted it, to be exact. I wanted to do something nifty with the glasses, but I ended up deciding that they look best blank white. I also kept the coloring extremely subdued, it just fits better that way.